The main character is 16-year-old Azra Ajmal. She is a Year 11 student of Muslim background, residing with her family in Sydney. She loves to study and is very passionate about chemistry, and dreams of attending university after completing high school. But her plans to further her education are thwarted when she learns that her family is arranging for Azra to be wed to a much older cousin in Pakistan. When Azra discovers this, she is understandably terrified and tries to find a way to fulfill both her dreams, and that of her family's. 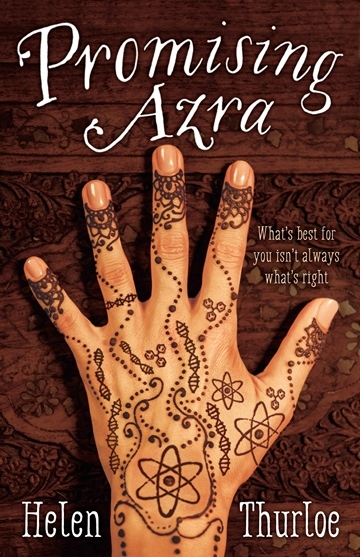 There were many times throughout the book that I felt so sorry for Azra, but I admired her determination and courage. Many times, Azra gets treated unjustly by her family. It's totally different for her older brother Rashid though, who is still respected by his family after his many transgressions. Her younger sister Soraya is an adorable character, very innocent and a lovely addition to the story. Azra is responsible for picking her up every day after school, and for most of the cleaning and cooking too. To a certain extent, I felt for Azra's parents. They wanted a better life for their children, and with the help of Azra's Uncle Zarar, they were able to achieve that by coming to live in Australia. He arranged their visa's, job opportunities, and accommodation. However, Zarar is controlling, and has the final say about all family matters. I wish they would've stood up to him a bit more, but their hesitation was warranted. Although it is a fictional book, there are many cases of arranged marriages still occurring in Australia presently. Helen Thurloe describes the Muslim culture well, and I enjoyed reading about their traditions in the story. I would've loved the ending to be a bit longer to answer a few more questions, but perhaps Helen can write a sequel?.. This book is targeted at young adults, but many adults will enjoy it too. I highly recommend it as this book bought the topic of arranged marriages to light, in a respectful and entertaining way. YA books have come a long way haven't they? This sounds great! There is so much I do not have direct knowledge of culturally in today's Australia but I like how this book goes some way to helping us all understand more. This book sounds like a fun way to learn a bit about different cultures. I love the cover too! Sounds like a fascinating read. I'm always interested in hearing the stories of Australian Muslims. They have so much culture and experience to share with the rest of us.